Another Clean Sweep Success in 2010! Again this year the Eastman Business Park experienced a very productive “Clean Sweep" in the month of June. We had a record number of volunteers, and the end result is evident each time you walk outside any of our buildings. 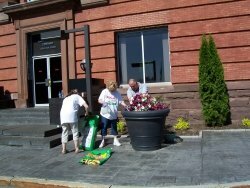 The clean up included sweeping, weeding and just general cleaning of the exterior areas around our building entrances. The various flowers planted have brightened up the site in a colorful and positive way. We've receive comments almost daily on how wonderful everything looks.